So you finally went ahead and planned the golf trip you’d been talking about for years? Great – it’s going to be awesome. Amid the joy of plotting the best courses, finding the right resort and securing good deals on airfare, avoid the common beginner’s mistake of failing to properly pack. This guide will serve to share lessons learned – what to bring (rain gloves! ), what to leave at home (that heavy golf umbrella!) – all through first-hand experience. The two best bets for travel bags are made by ClubGlove and Sun Mountain. Yes, they’re pricey. Are they worth it? It depends. Is this a one-off trip, where the bag will collect dust once you return? Then just use ShipSticks, Luggage Forward or some other provider that can handle your clubs for you. For our purposes, we think you’ll be hooked on golf travel after a small taste. Sun Mountain’s ClubGlider Meridian is made from ballistic nylon and can withstand all the chucking, slamming and tossing an airline is sure to inflict on it. What makes the ClubGlider stand out? It has two extra wheels that pop out from its base for easy rolling throughout the airport and to your hotel room. If you skimp and end up with a cheap, plastic case or one without wheels – you only have yourself to blame. The ideal complement to the travel bag is ClubGlove’s Stiff Arm. It’s a dead simple product designed to be extended taller than your driver, placed in your bag and take the brunt of any pain the bag receives in travel. Thirty dollars well spent. One theme throughout this guide is prepping for unexpected inclement weather. On a golf trip, rain shouldn’t stop you. Be proactive and get a waterproof bag. Vice Golf’s first foray into stand bags is our choice here. The German brand that specializes in selling high-quality balls direct to consumer offers two color options (all black or gray/lime) and delivers luxury feel for a moderate price. The waterproof seams are the standout here, as nothing can derail a trip more than a water-logged wallet or phone. The six-way full length divider is key to protect your club’s shafts in travel. ClubGlove’s Rolling Duffle III is designed to be checked at an airport, but it’s not an unruly size. 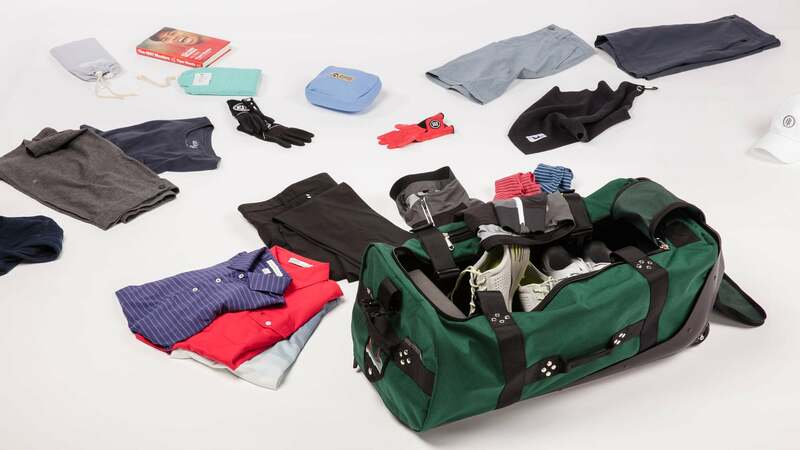 It’s not hard to fit a week’s worth of gear inside and features some of the same attributes that makes the golf bag so great, notably the plastic wheelbase and Cordura nylon. Hudson Sutler’s specializes in duffel bags of all sizes, but their valuables pouch has proven invaluable on recent trips. If you’re constantly on the move for your trip, having one place you know contains your wallet, keys, battery pack and extra cash is handy. Going from hotels to bag drops to trunks, bad things can happen. Avoid disaster. Golf clothes shouldn’t be a costume. If need be, players should be able to go from the course to a restaurant without screaming “I played golf today!” with their attire. Holderness and Bourne is a New York City-based company that is super-golfy, classic and tailored. They also sell duffels and shoe bags, but polos are the bread and butter. A built-in collar stay and cutaway collars are two subtle features that show their attention to detail and elevate H&B’s shirts. Criquet Golf offers old-school vibes in modern materials. The super-soft Players Shirt features a deep four-button plaquet and is made from organic cotton jersey for a true throwback feel. Bradley Allan’s shirts are thoughtful and unique without being overly showy. The Gradient Polo is a smooth blend of pima cotton and polyester. The connection between all three brands: each can be worn off the course as easily as on. Ably has created a line of shirts, hoodies and pants that are made from Filium and are stain and smell proof. A shirt that can be worn over and over throughout the week? That’s a no brainer for travel. Devereux’s polos also fit the above requirements, but it also makes a dead-simple and comfortable hoodie that’s perfect for travel. J. Lindeberg’s offerings are slim fitted – which means you may need to size up – but if you are after a tailored look on the course, its golf pants are tough to beat. Constructed with 9% elastane and a tapered leg, these bottoms combine fashion and function. Devereux’s Cruiser shorts can be worn anywhere – the course, pool, car or airport – and come in two color options. Mack Weldon’s 4-Way short could also be trotted out on the course in a pinch, but they’re best for lounging or sneaking in a workout. One pair of shoes won’t fly for a full weekend of golf. Having a secondary pair – if only to swap out if the first pair get wet – is vital. ECCO’s Cage Pros have extra heel stability and are some of the most comfortable spikeless shoes you can buy. Nike Golf’s Lunar Controls are worn by Rory McIlroy, and the white option can be worn with any color combinations. Mack Weldon’s no show socks offer a clean look. Plenty of golfers play once a week, then go on a dream trip and tire out after the third round in three days. Rad’s All-In Kit can help. Small enough to fit neatly in your luggage, the all-in-one comes with a handheld roller and four different options of roller balls. After a round, 10 minutes working your hamstrings, thighs and feet with these will keep you fresh for that 36-hole day scheduled for next day. Galvin Green has staked their claim as the premier manufacturer of rain gear for golf. It outfitted the 2016 European Ryder Cup team, and if you’ve been to the U.K, its “waterproofs” are everywhere. The latest pullover option is the Argon with Gore-Tex and new C-Knit Backer technology. It will set you back more than a driver, but there’s a case to be made it’s more valuable. Thanks to genius cuff and collar design, no water is sneaking in. It’s better than any bulky golf umbrella. Speaking of rain, weather-proof gloves are probably the cheapest thing in this guide, but perhaps the most indispensable. When it rains, the ratty glove you were wearing will further deteriorate. FootJoy has the best value: buy a pair of rain gloves and receive a free small towel. They’re $20 – you would probably pay $200 for them in the midst of a downpour. A steady stream of capable towels are vital as well. Indigo Towels makes colorful options that are made in Turkey from Turkish cotton. They meet the requirements of a towel: tough and light. Get two and wrap them around your irons for extra cushioning while they travel. And speaking of cushioning, headcovers for your woods play a big role. We’re in the golden age of custom headcovers, so there’s no reason to have anything generic in your bag. Our favorites: Seamus Golf, Stitch and Rose and Fire. Seamus excels in handmade wool offerings in any tartan pattern imaginable. (Along with bespoke shoes, bags and hand-forged metal accessories.) Stitch makes hardy but supple leather headcovers in a variety of racing stripes and colorways. Rose and Fire uses leather too, but makes the best use of ballistic nylon, as well as creating patterns you won’t find anywhere else.